Mr. Flake a conservative Republican, was calling his president out for a lack of character and a lack of allegiance to underlying democratic values. Values that transcend political affiliation. He was calling out his fellow Republicans in Congress for their often silent complicity. Complicity in not confronting their president, for his lack of decency and integrity. What draws me to this speech is his passionate reminder to affirm what we hold in common. He reminds us that democracy is a fragile enterprise that transcends disagreements on policy. Democracy can only survive and flourish as we remain true to our underlying democratic values. Mr. Flake also announced that he would not run for reelection. An acknowledgment that he could not survive a primary against a political opponent who embraces Trumps divisive political formula. Such is the political climate within which we live. Yesterday, Jeff Flake was a profile in courage. Speaking truth to power and calling his colleagues in Congress both Republican and Democrat to accountability. To practice good governance where compromise is not a dirty word and demonizing the opponent in 140 characters is not allowed to stand. David Brooks a conservative commentator for the New York Times has written a book entitled: ‘The Road to Character’. He focuses on the deeper values that should inform our lives. Brooks call us to rebalance the scales between our “resume virtues” – achieving wealth, fame and status – and our “eulogy virtues,” those that exist at the core of our being: kindness, bravery, honesty and faithfulness. Brooks and Flake remind us that as a nation we are at our best when we seek to live by our ‘eulogy virtues ‘ those positive even noble values that inspire us to be a good and principled people. This is what Jeff Flake (and Bob Corker and John McCain) have chosen to stand for. 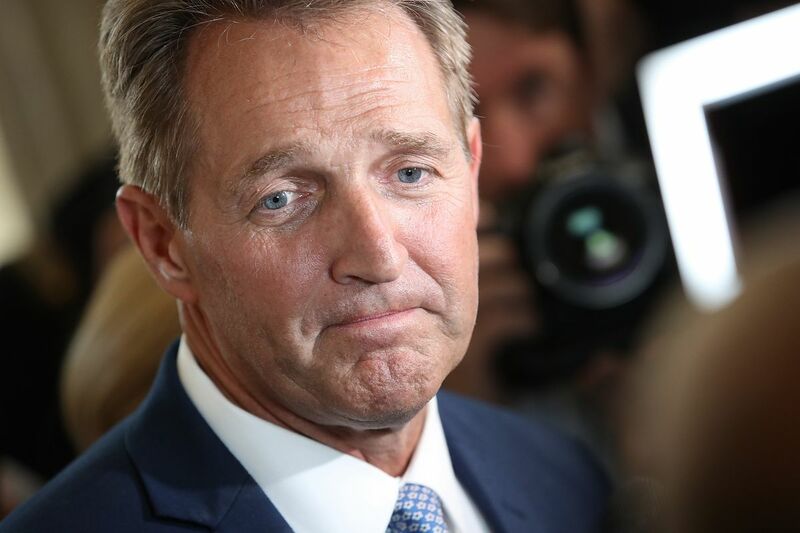 Jeff Flake calls upon elected officials to ensure our core values remain in place. He calls citizens like you and me to understand and uphold our core democratic values. To strive to become what Abraham Lincoln called ‘a more perfect union’. This has always been our strength and our hope. Thanks Marge! Keep up the good fight. One wonders just how many others there are whose ongoing battle with their consciences and potential damage, perhaps permanent, to their careers struggle with more than a few sleepless nights? I hope it leads to some serious bouts with conscience. I hope their sense of doing what is right prevails. It will take courage. The risks of alienating a rabid, narrow base in a political primary is real. As Jesus made clear through life, words, and death at the hands of malevolence, true love and righteousness are quite costly. But an empty tomb promises that new life always prevails in the face of ignominious death. Good always triumphs over evil…ultimately. That are hope for sure.